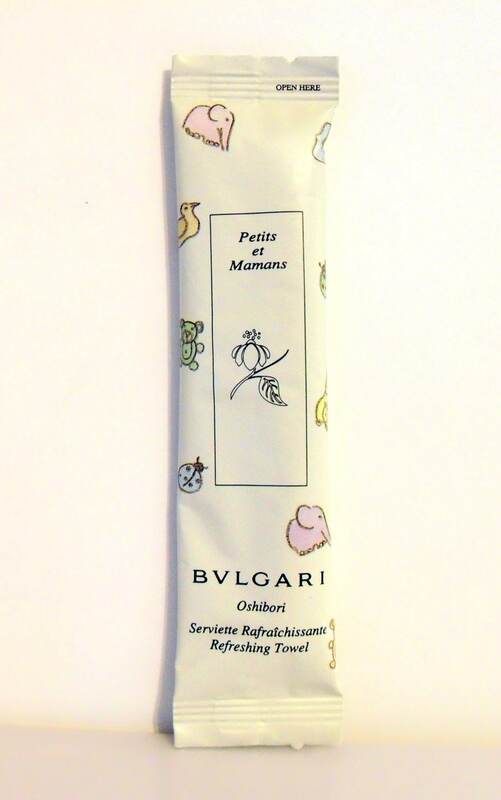 Vintage 1990s Petits et Mamans by Bvlgari (Bulgari) 0.42 oz Oshibori Refreshing Towel in Packet. This is a cotton towel that has been soaked in the perfume. The packet has never been opened, but I don't know how good the towel will be to use, it is being sold as a collectible only. The perfume is old and no longer fresh. I do not think Bvlgari produces the Oshibori towels in the Petit et Mamans fragrance anymore. The exclusive fragrance house of Bvlgari created Petits et Mamans in 1997. The line which includes fragrance and bath products celebrates the unique bond between mother and child. The soothing range has chamomile tea as its main ingredient and the fragrance features a unique talcum powder accord.